Happy Needle and Thread Thursday, friends! 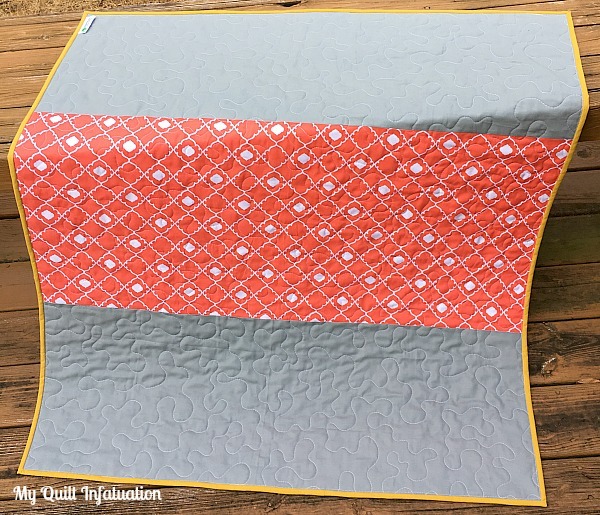 I've been working on a new quilt for the past couple of days, and though I am terrible at keeping quilty secrets, it is a must. Being a grown-up is hard sometimes. I can give you a sneak peek though. 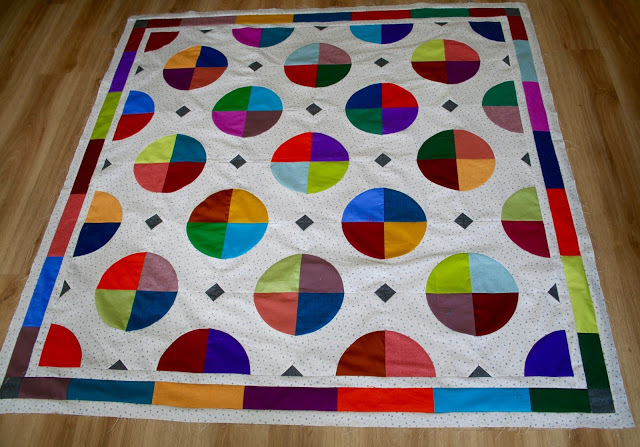 Gosh, I never seem to tire of sewing a rainbow! 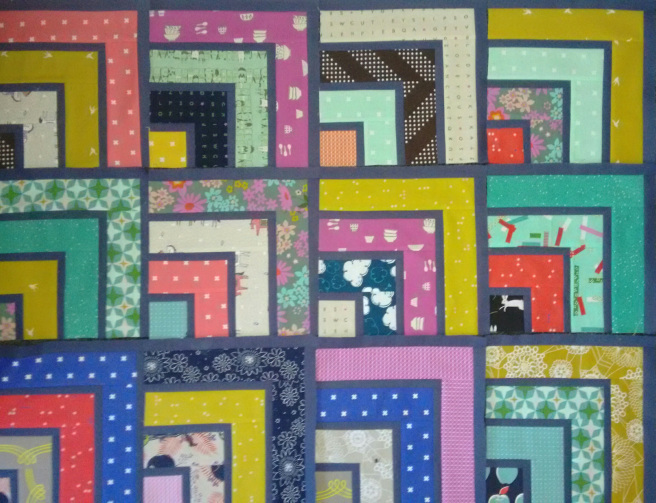 That's all I can show you for now, though I hope to give you another little teaser when the quilt is put together. 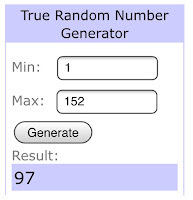 Before we get to the highlights from last week's party, I owe you four winners! 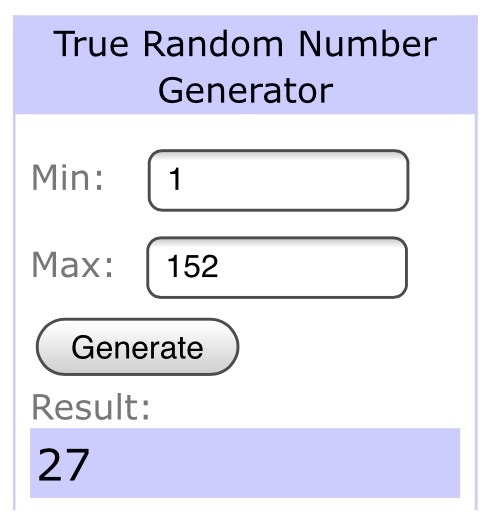 As always, the winners were drawn in the order that the prizes are listed in my post. 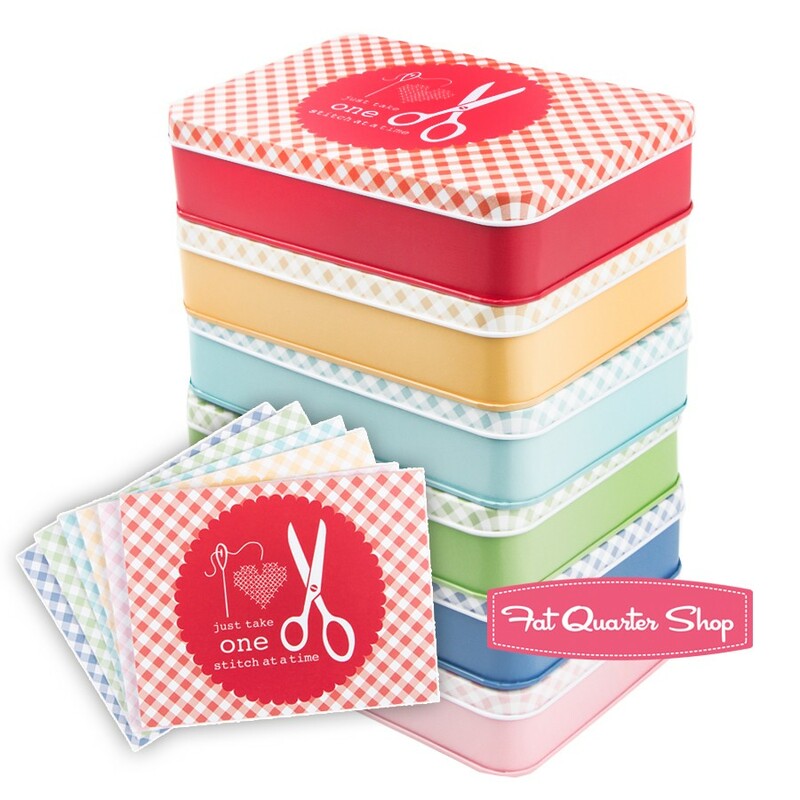 First up, the winner of the super cute Lori Holt tins and notecards, provided by Fat Quarter Shop is comment number 27, Sue Green! 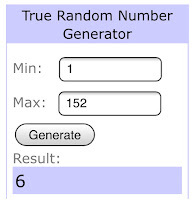 Next up, the winner of the $25 gift certificate to LouLou's Fabric Shop is comment number 6, Anita. The winner of the third giveaway, the Autumn bundle provided by Fort Worth Fabric Studio is lucky number 15, Claire Sutherland! And last, but certainly not least- the winner of the Bloom Where You're Planted bundle from Fort Worth Fabric Studio is Janie, comment number 97! 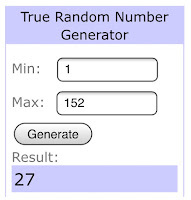 Enjoy your prizes, ladies! Now, let's get to some of the fantastic projects shared as last week's party, and oh my goodness, there were lots! 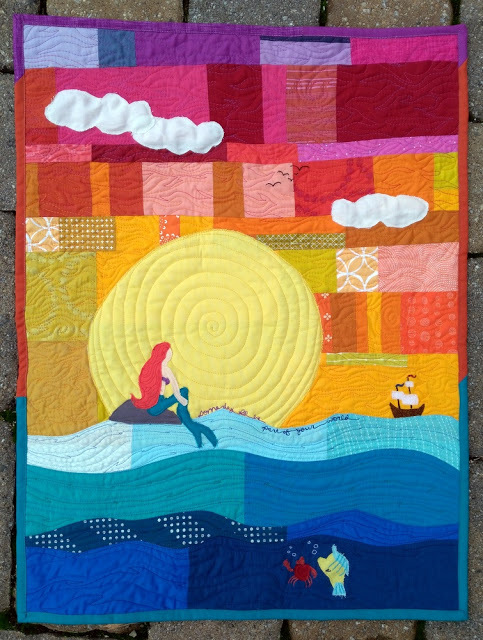 This Little Mermaid mini by Jess at Quilty Habit is just perfection. Look at the detail! 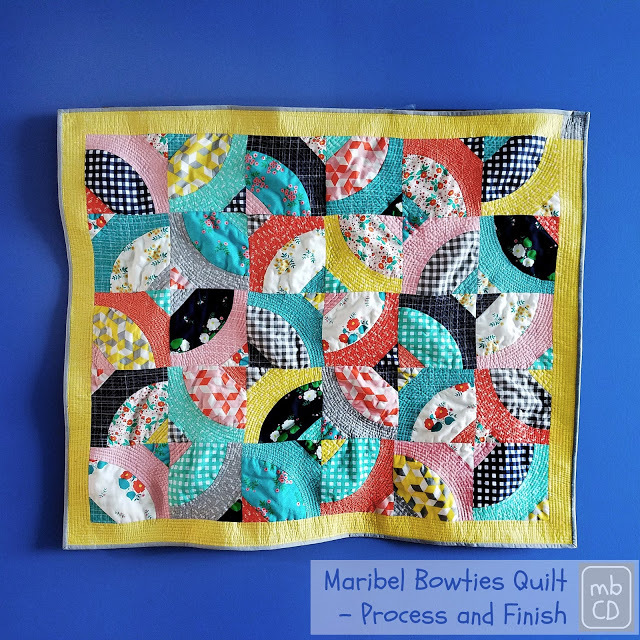 And finally, this hexie stunner is by Maryse Makes Things. 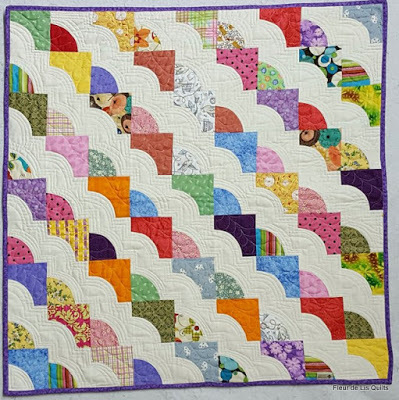 That border is the bomb, and the quilting adds so much great texture! Alrighty y'all; let's party it up! 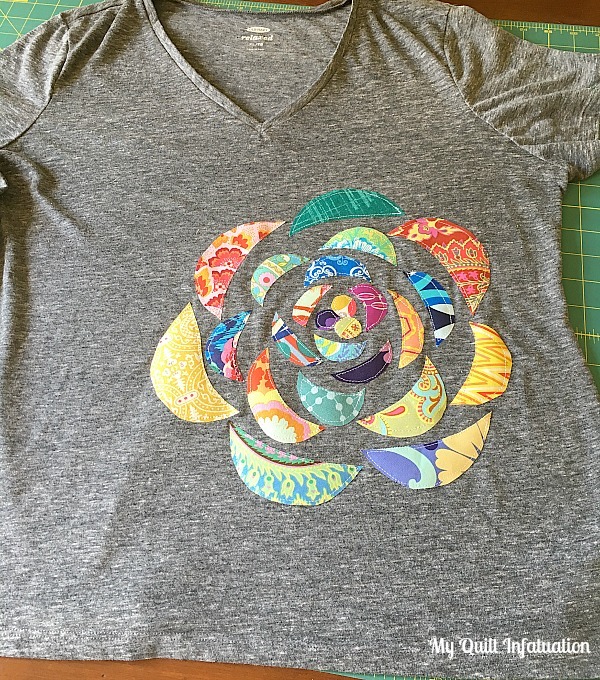 Link up the latest happenings in your sewing space! Happy Needle and Thread Thursday! In case you missed it, yesterday I have four giveaways going on right now, so be sure to go HERE to enter! 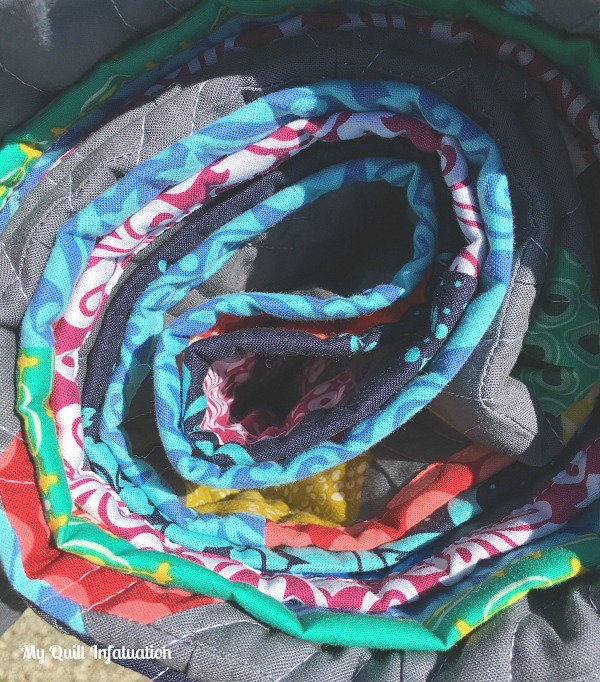 Yesterday and today, I have been having fun playing with the leftovers from my Boho Beads quilt, and turning them into a simple and chic baby quilt. My cousin is expecting twin girls in January, and this one is destined to be well snuggled by one of them. 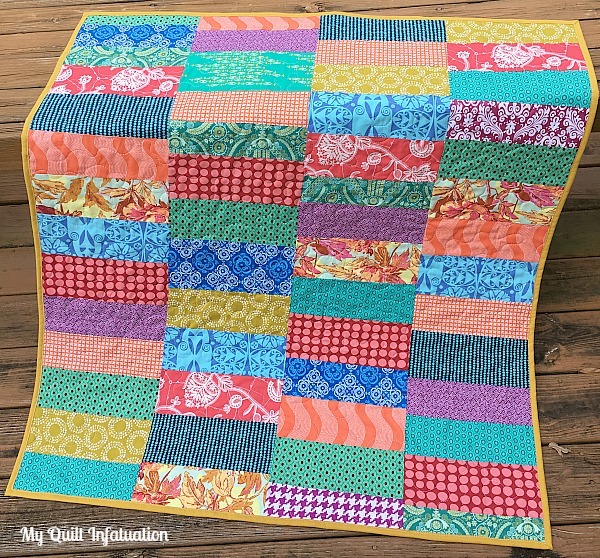 On the back, I used a stripe of coral medallion fabric, along with Kona Shale, which really offers a little bit of calm to this bright and busy quilt. The binding is Cloud 9 Cirrus Solid in Amber, which is just perfect for making some of the yellows and chartreuse in the prints really pop. And I always like to quilt baby quilts with a wider stipple, to keep them soft and easy to snuggle. This finished quilt measures 40" x 45," and I love how the simplicity of the pattern really lets the fabrics shine. This little quilt is not my most exciting news from my week though! 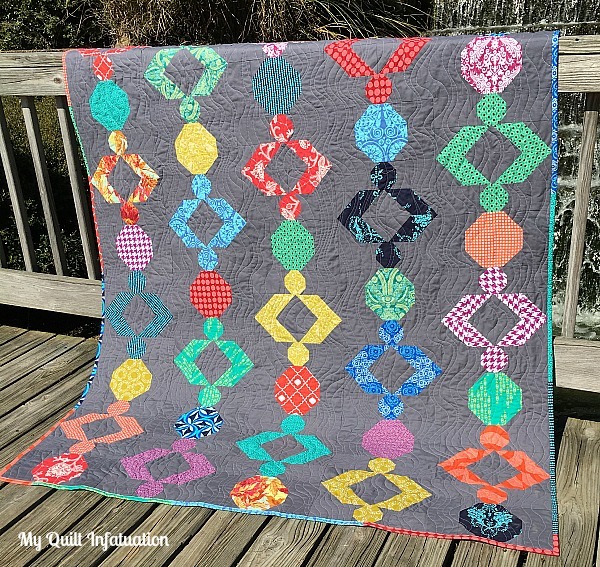 This past weekend, I had the wonderful opportunity to present a trunk show and teach my Bubble Bath class at a quilt retreat in Hattiesburg, MS. 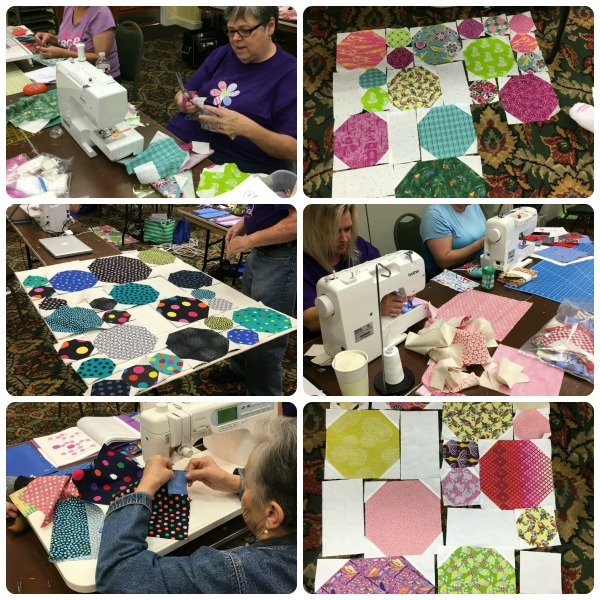 It was an amazing group of quilters, and we shared a lot of laughs throughout the day. It is always neat to see how others interpret my patterns! Here are a few fun pics from the day. By the way, I would love to present a trunk show or teach to your group. I'm booked through 2016, but I am currently taking bookings for 2017. Check out my Teaching page (at the top), or just send me an email for more information. 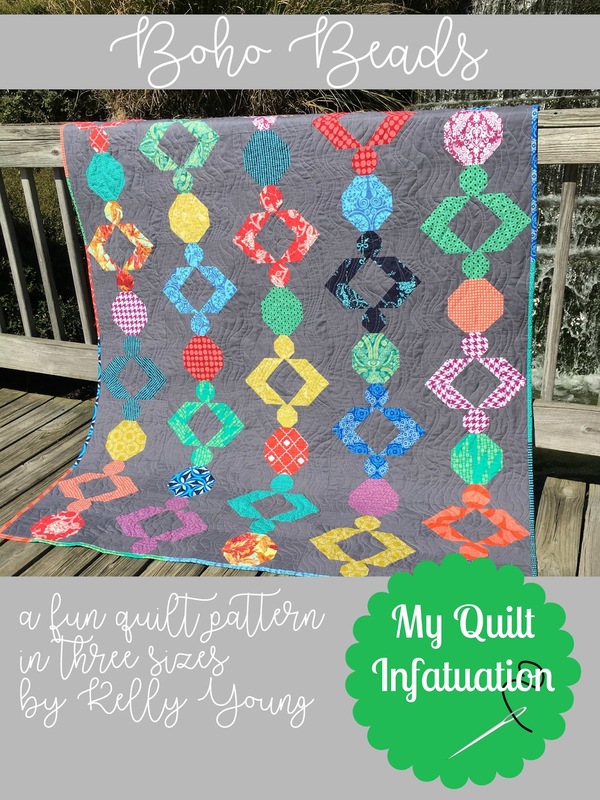 Let's have a quilt party! 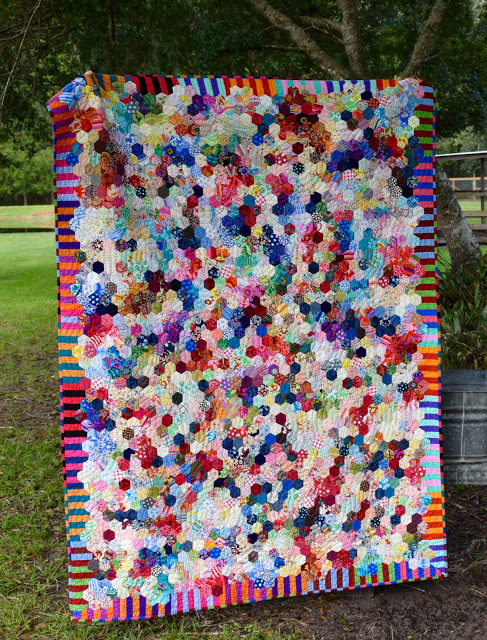 Last week's NTT had some amazing projects linked, like this Knots of Color quilt by A Dream and A Stitch. and Jayne at Twiggy and Opal turned her daughter's art into this stunning mini! Y'all rock it out every single week! Let's party, friends! **PLEASE NOTE- recently, there have been several spam links on our parties that are not quilting and sewing related. My initial reaction was to delete them immediately, but my linky service provider has asked that I leave them so they can be investigated and permanently blocked. I will remove those links after my provider has all of the info he needs but it may take a few days. 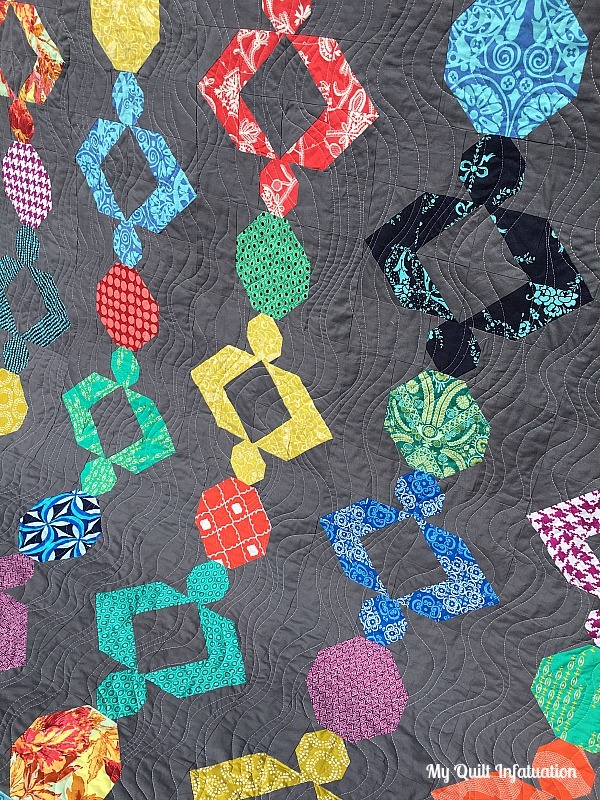 So, please do not click on any links that are not clearly quilting related, and thank you for your understanding! It is so difficult to believe that 2016 is close to being on its way out. After all, the weeks from Halloween through New Years Day seem to fly by in a flash, and adding to the mayhem for many is the long list of holiday sewing that needs to happen between now and then. 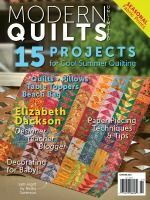 Well, hopefully a few great fabric sales will help you knock those projects out with plenty of time to spare. 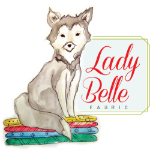 First up, check out what's happening at Lady Belle Fabric! 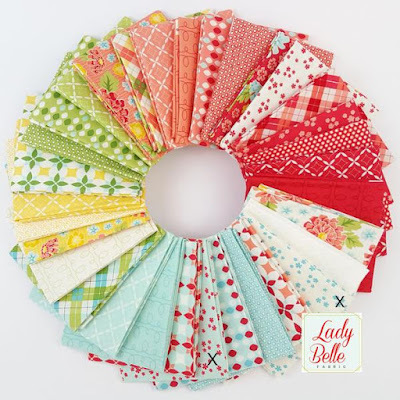 Right now, the kind folks at Lady Belle are offering 30% off of tons of clearance bundles, PLUS 20% off all other bundles through today only. That's a huge opportunity if you have your eye on a special collection, so don't miss out! 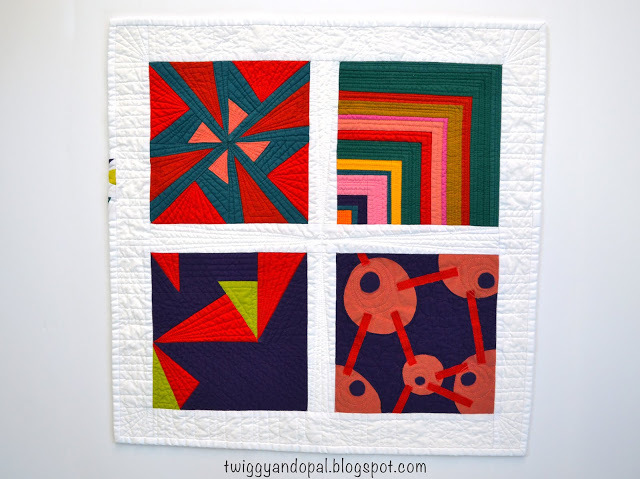 I know it's already fall, but I still have my eye on this bright and happy Summerfest bundle by April Rosenthal. 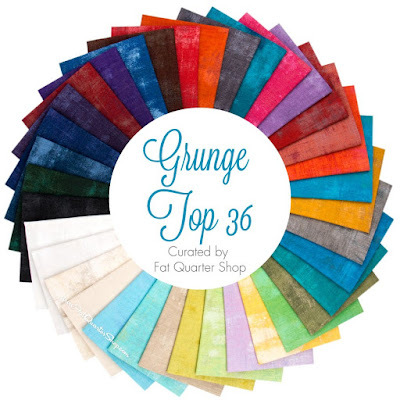 Fat Quarter shop is up next, and I don't know about you, but at the beginning of every month, I always love to check out their monthly picks. They offer a basic, a notion, a book, and a pattern at 20% off for that entire month; and boy, this month's basic is a doozie- Grunge Basics! 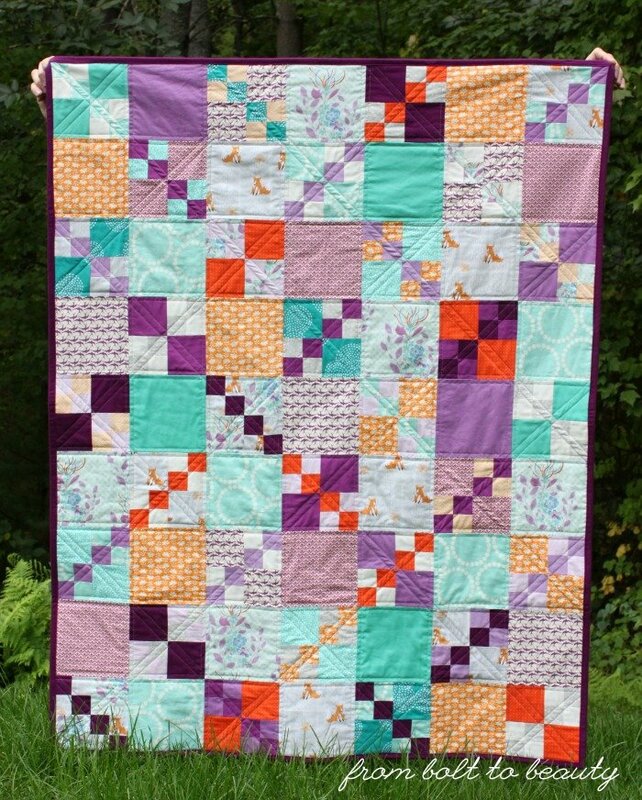 I just love the subtle texture that the Grunge fabrics add to a quilt. Fat Quarter Shop is also sponsoring the first giveaway of the day! 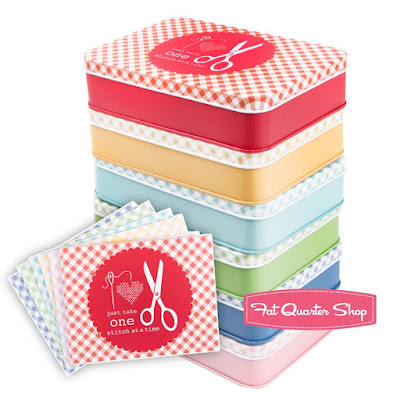 They are generously offering a full set of these adorable Lori Holt keepsake tins and cheery notecards to a lucky reader. Each tin has a different design, and the possibilities for these are endless. I know we can all use more storage in our sewing space- especially storage that is so stinking cute! You can get more info and see individual photos of each tin HERE. 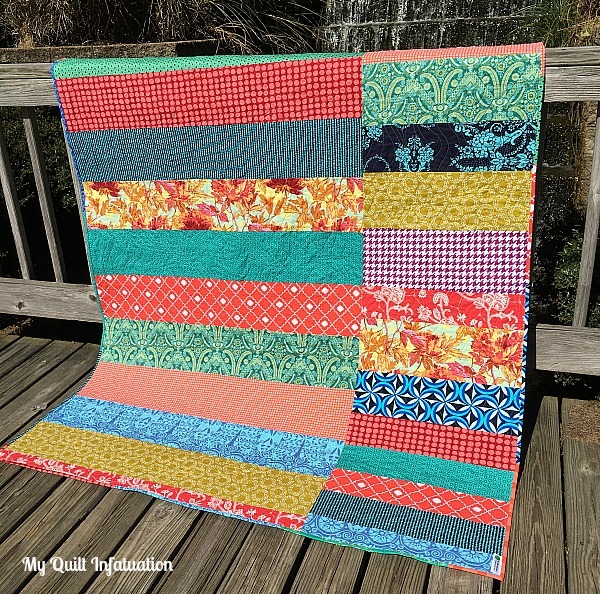 At LouLou's Fabric Shop, there are lots of new collections, but my favorite has to be the gorgeous Acreage collection by Shannon Gillman Orr. The colors are just so lush and vibrant. Another thing I always keep my eye on at LouLou's is their preorder section. 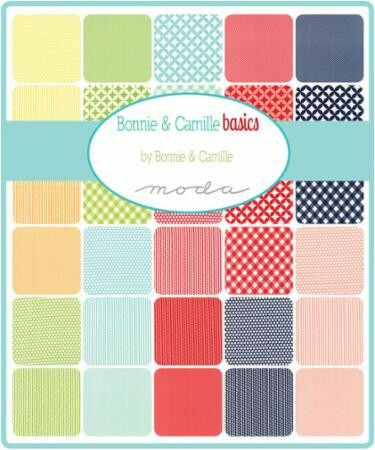 You can save 10% all the time with the code preorder, and right now, they have Bonnie and Camille Basics available for preorder! 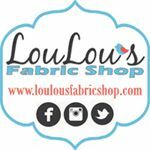 LouLou's Fabric Shop is sponsoring the second giveaway of the day, a $25 gift card to a reader, to spend any way you choose! May I suggest taking a look at their SALE section? ALL sale fabrics are marked down to $6.50/yard right now. That's tough to pass up for sure! 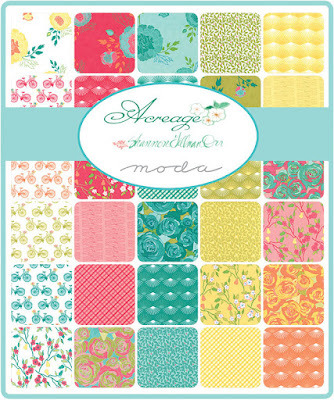 Go right HERE to see all of the fabrics on sale! 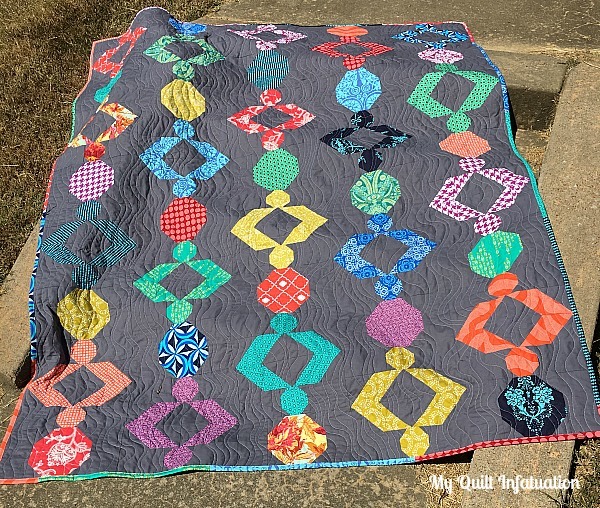 Though my next shop is not a place to find beautiful fabrics, They have made it possible to add a professional touch to each and every quilt, pillow, and mini I make. I am referring of course, to my beautiful ribbon labels from Finer Ribbon! I purchased my labels over a year ago, and I have not regretted that decision for one second. The labels are soft, fully washable, and the printing is vibrant and rich. Best of all, Finer Ribbon's customer service is top notch. 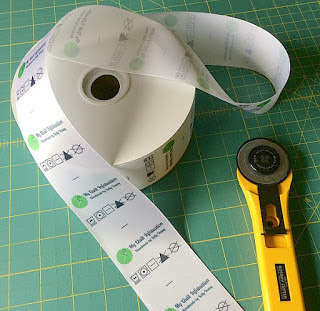 My labels can be found HERE. They are 2.25" wide, and printed from side to side (not running the length of the ribbon). The spool contains 1000 labels, which means that they are about ten cents each! I know that it will take me years to use all of them, and that's an amazing deal. They can be designed with a logo if you have one, or with just a loving message. I fold and sew the label right into the binding, and the laundering instructions are on the back side. 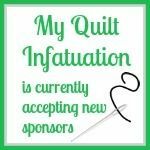 So, if you're looking to add a professional touch to your quilts, pillows, or garments, or looking for an amazing gift for a special quilty friend. 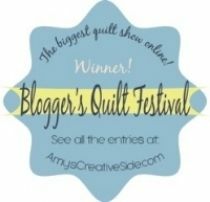 I highly recommend checking out Finer Ribbon! 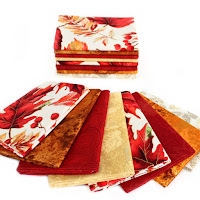 If you're thinking a little more long term than this holiday season, Shabby Fabrics has you covered. 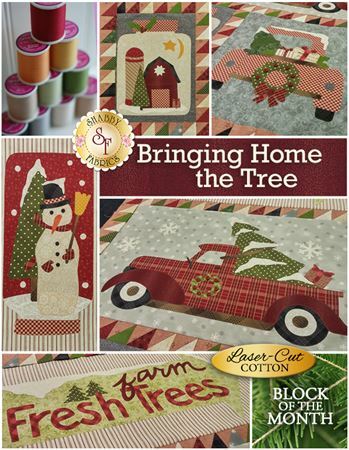 Their Bringing Home the Tree Block of the Month Club will run from February-August 2017, and you'll have a cozy holiday quilt all ready for next year! Shabby Fabrics pre-fuses and laser cuts all of the appliqué pieces for you, so all you have to do is peel off the paper, iron in place, and stitch around the edge to finish. Easy peasy! You can find out more information on this BOM HERE, and sign ups are open now! 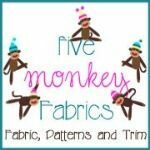 Five Monkey Fabrics is a small shop with big customer service. In fact, one of the best things about working with a smaller shop is the ability to really individualize your order. 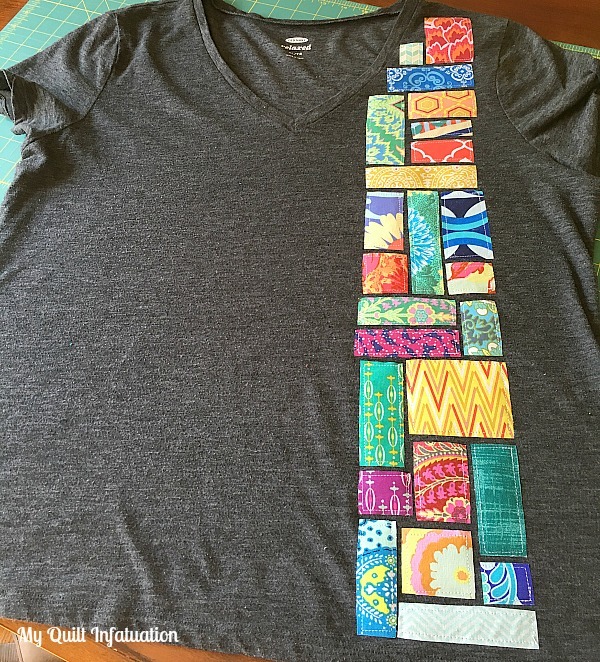 Five Monkey Fabrics is happy to put together a custom order for you if you just ask! 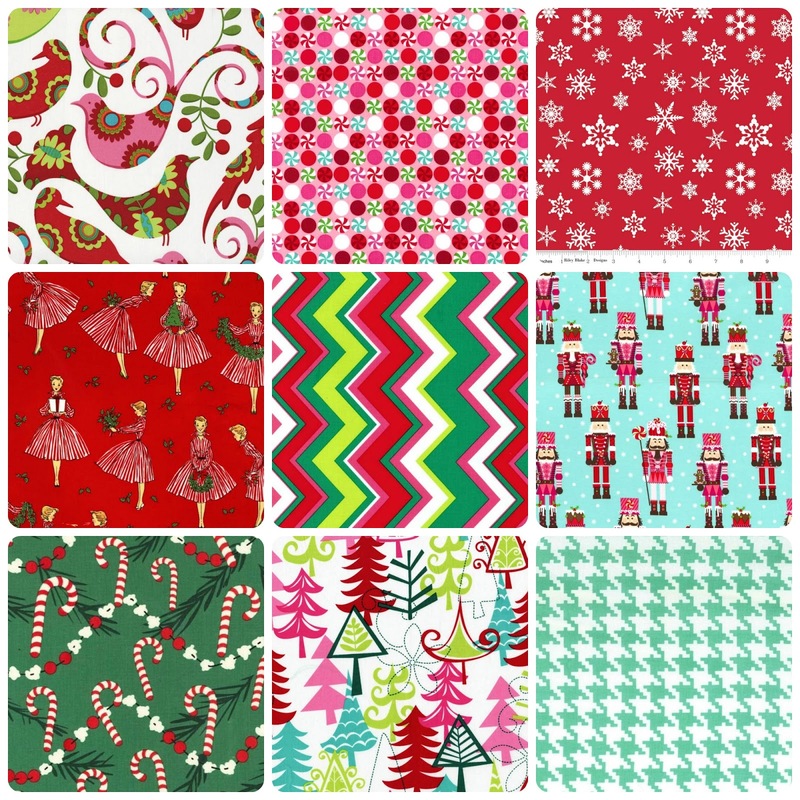 Check out this sampling of in-stock Christmas fabrics. Though these are not offered as a bundle in the shop, a special order of this kind is no problem, and even welcomed! And, you can always take advantage of free shipping for orders over $50 with the code freeship! 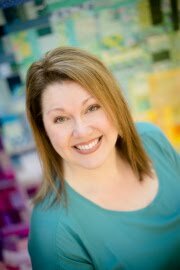 Last, but certainly not least is Fort Worth Fabric Studio, who also happens to be sponsoring the final two giveaways! 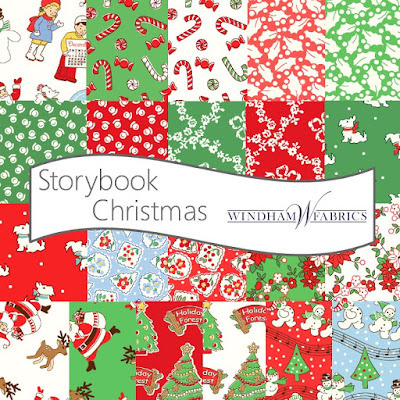 Through Thursday, FWFS has the fun Storybook Christmas collection on sale for 30% off with the code STORYBOOK30! On of my favorite features of Fort Worth Fabric Studio is their specially curated bundles. 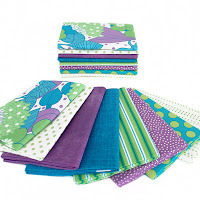 They've taken the guesswork out of fabric coordinating, with perfectly coordinating prints from several collections, creating a single bundle with plenty of wow factor. A new 8-piece bundle is revealed each Friday in their Friday Bundle Batch, and these are equally perfect for a special project or just stash building. FWFS is kindly sponsoring the final two giveaways of the day. They are offering two different fat quarter bundle prizes this month- Autumn Pieces and Bloom Where You're Planted. They're very different, but both so beautiful! Whoa! I know that's a ton of great information, but hopefully you can take advantage of some of these amazing sales to really keep your sewing fun and productive in the upcoming holiday season. Okie dokie, friends! 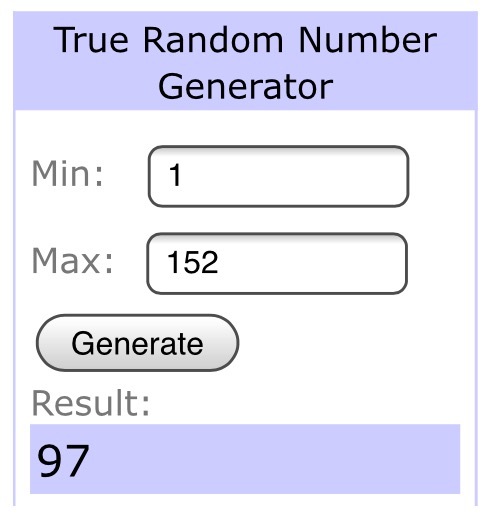 Time to enter these three fantastic giveaways. Just leave a single comment on this post to let me know what has really caught your eye this month. Remember to leave an email address if you're a no-reply blogger, and only one entry per person please! Unfortunately, replies to your own comment counts as an entry (the system numbers those, too), so remember to put your email address in your comment. Additional replies/comments/entries are always deleted. I'll announce the winners at NEXT week's NTT (October 26th). 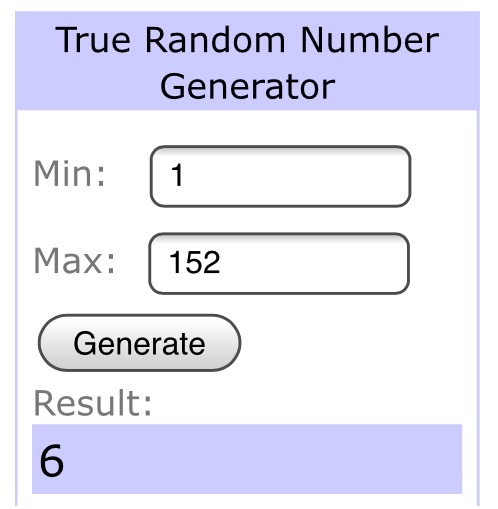 This giveaway is now closed! I'll announce the winners at this evening's Needle and Thread Thursday. Remember, I host giveaways often, so be sure to subscribe by email or your favorite blog reader to make sure you don't miss out! In August, I had the pleasure of presenting a trunk show to the Tennessee Valley Quilters Association for their annual Assembly Day. This is a group of several guilds in Tennessee and northern Alabama, totaling around 500 members. 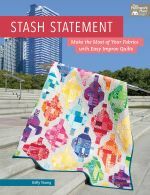 Kaye England, a prolific traditional quilter and author, was the other speaker at the event, and she and I had some time to chat (she is a hoot!). 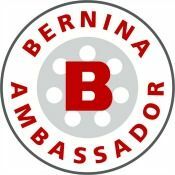 When she and I discussed sewing machines, and she found out how much I love my BERNINA 550 QE, she suggested that I check into the Ambassador program. 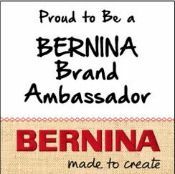 I am so proud to announce that I am a new BERNINA Ambassador, which means first and foremost, that I openly and wholeheartedly support the BERNINA brand. 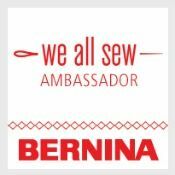 It also means that I'll be contributing projects to We All Sew, BERNINA USA's blog, among other activities. I have been vocal about how much I love my sewing machine, and the BERNINA brand in general since purchasing my BERNINA 550QE over three years ago, but I am excited to now have a formal partnership with such a great company. So go ahead- ask me why I love my sewing machine!